Estampados Pérez is a family company located near Barcelona in the city of Mataró. Eight siblings, including José Pérez and his wife Maribel Muñoz, run the company. According to José Pérez, the secret of their success is providing comprehensive, high-quality, fast, and accurate services at a local level to clients who put their trust in them. 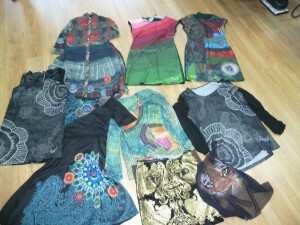 For the past 30 years, Estampados Pérez has focused on fabric printing. This experience has helped the company stay one step ahead of the market. For example, before the crisis hit the textile market, they expanded their business with new facilities in the south of the country, including Malaga, as well as in Morocco. Their innovation continued when, a little over a year ago, they decided to add a sublimation fabric printing process to their production line. 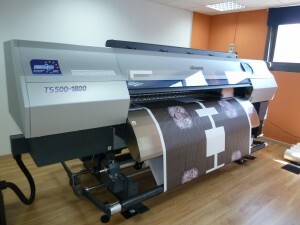 Since then, they have continued to stay ahead of the market, installing two Mimaki TS500 printers. The addition of these new printers has given Estampados Pérez an incredible volume of growth in a difficult economic climate. Muñoz explains that their success began when they acquired a Mimaki TS5 printer. This printer was used to service the needs of a few clients who needed small production runs. At that time, Estampados Pérez outsourced its high volume orders. The experience with the Mimaki TS5 printer was a success. Clients were satisfied with the results, and the market responded with more work for Estampados Pérez. A little more than three months later, the company purchased their second TS5 printer. Their success continued, and only six months after purchasing their first Mimaki machine, the demand for this service had grown so much that they had to get a third TS5. Maribel Muñoz explains that just after they bought their third TS5, Mimaki came out with the TS500. At that time, they decided to go for this more productive format. 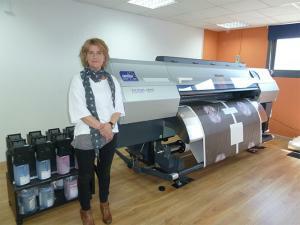 They sold the first TS5 and bought a TS500, the first machine of this type installed in Spain. Estampados Pérez was happy with the production of the TS500. Given the increase in demand, it wasn’t long before the second TS500 arrived, about a month ago. 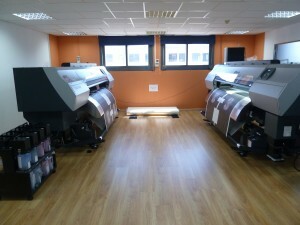 Now, after only a year since their first purchase, Estampados Pérez can say without a doubt that the inclusion of sublimation printing in their production processes has been an outstanding success, as the number of metres printed so far clearly shows: 230,000 metres. This success has been possible thanks to their large production volumes and to all the many clients that put their trust in Estampados Pérez, including: Zara, Bershka, Stradivarius, Desigual and Mango, to name just a few. Located near Barcelona in the city of Mataró, Estampados Pérez is a family-run company that has been focusing on fabric printing for more than 30 years. The company has achieved a tremendous success by providing comprehensive, high-quality, fast, and accurate services at a local level to clients who put their trust in them. With facilities in the south of the country, including Malaga, as well as in Morocco, Estampados Pérez has always been one step ahead of the market.